Sanjay Mehrotra (left), Jim Luedtke, and Alper Atamtürk. 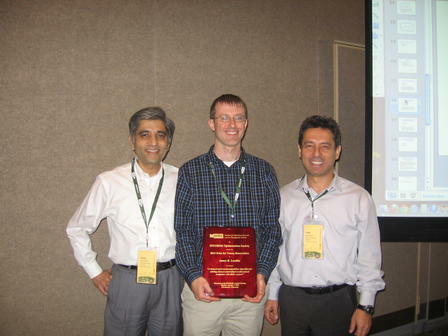 The 2013 recipient of the Prize for Young Researchers of the INFORMS Optimization Society is Jim Luedtke, for his paper "A Branch-and-Cut Decomposition Algorithm for Solving Chance-Constrained Mathematical Programs with Finite Support," Mathematical Programming (2013), DOI 10.1007/s10107-013-0684-6. Although chance (probabilistic) constraints are very useful in modeling uncertainty, they often lead to notoriously difficult non-convex optimization problems. The cited paper proposes an exact and surprisingly effective algorithm for optimization over chance constraints. In his PhD thesis Jim Luedtke gave an effective cutting plane approach to solve chance-constrained optimization problems with right-hand-side uncertainty. In the current paper, the author shows a clever way of integrating cutting plane and decomposition methods to handle the much more difficult matrix uncertainty case with surprising effectiveness. Numerical implementation demonstrates the proposed approach to be of orders of magnitude faster than standard modeling and decomposition approaches for optimization with chance constraints. The cited paper has the potential to make a very significant impact in the numerical solution of a broad class of stochastic optimization problems. Alper Atamtürk (Chair), Samuel Burer, Andrzej Ruszczynski, Nikolaos Sahinidis.